Nikky Haley, the vociferously anti-Palestine US Ambassador to the United Nations, warned member states last year she will “take down names” of those who vote against American interests in the world body—perhaps with the implicit threat of cutting US aid to countries that refuse to play ball with the diplomatically-reckless Trump administration. 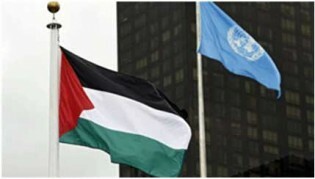 The Group of 77 (G77) -- the largest single coalition of developing countries at the United Nations-- is to be chaired by Palestine, come January. When the Charter of Algiers was adopted 50 years ago, it marked the unity of the Group of 77. This unity has not wavered since then. Development should be about more than building roads or buying air conditioners, the President of the UN General Assembly, Peter Thomson told IPS in a recent interview. As the United Nations commemorated the 30th anniversary of the “Right to Development”, the Group of 77 (G77) and the Non-Aligned Movement (NAM) expressed strong collective support for one of the basic human rights described as a key element in the implementation of the UN’s post-2015 development agenda. The 133-member Group of 77 (G77), joined by China, unanimously endorsed a Ministerial Declaration strongly reiterating its support to the UN’s post-2015 development agenda, including the 17 Sustainable Development Goals and the Climate Change agreement. On Friday, a group of 134 developing nations, known as the Group of 77 (G77), came together for a meeting to address challenges and solutions in achieving sustainable development. In attendance were G-77 Foreign Ministers, the President of the General Assembly, the UN Secretary-General and other UN senior officials. The high seas - oceans which fall beyond the jurisdiction of any country - make up about two thirds of the world’s ocean and half of the total surface of planet earth. Despite Western opposition, the 134-member Group of 77 is continuing to pursue a longstanding proposal for an inter-governmental UN-affiliated tax body aimed at combating corporate tax dodging and curbing illicit financial flows, including money laundering and off-shore banking. IPS spoke with the Virachai Plasai, Ambassador and Permanent Representative of the Kingdom of Thailand to the United Nations and Chair of the Group of 77 about what it’s like to represent 134 developing countries, including China, at UN meetings in New York. Plasai spoke about some of the group’s priorities for 2016, including the selection of the ninth UN Secretary-General, the 2030 Development Agenda, including the 17 Sustainable Development Goals, and the implementation of the Paris Climate Change Agreement. The UN Conference on Trade and Development (UNCTAD) concluded its five-day meeting in Nairobi on a positive note—the launch of a new e-trade initiative and a multi-donor trust fund on trade and productive capacity. The President of the 70th Session of the UN General Assembly, Mogens Lykketoft, has helped spearhead a push for a more open and transparent selection process for the next UN Secretary-General. UN member states “are going beyond rhetoric and earnestly working to achieve real progress” towards the Sustainable Goals, the members of the Group of 77 and China said in a ministerial statement delivered here on 18 July. The United Nations will undertake a major review of progress made in the world’s 48 Least Developed Countries (LDCs) later this month. The 134 members of the Group of 77 and China (G-77) made their mark on the Paris Climate Change Agreement and should now adopt a program of action to implement it, Ambassador Ahmed Djoghlaf told IPS in a recent interview. Opinion: China’s New South-South Funds – a Global Game Changer? South-South cooperation is usually seen as a poor second fiddle to North-South aid in the world of development assistance. Indeed, developing countries’ policy makers themselves insist that South-South cooperation can only supplement but not replace North-South cooperation. It has become clear that the South, including the least developed countries, has little reason to expect any real progress to the almost half century old commitment to transfer 0.7 percent of developed countries’ income to developing countries. But to add insult to injury, developing countries have, once again, been denied full participation in inter-governmental discussions to enhance overall as well as national tax capacities. Back in 1996, when South Korea voluntarily quit the 132-member Group of 77 (G77) – described as the largest single coalition of developing nations -- it joined the 34-member Organisation for Economic Cooperation and Development (OECD), long known as the “rich man’s club” based in Paris. The final round of negotiations on the Sustainable Development Goals – the successor to the Millennium Development Goals, due to be inaugurated in September at the U.N. General Assembly – is now underway in New York.